Step into D Pavilion, and you’ll feel as if you’ve been transported into a different era altogether. The villa’s mid-twentieth century architecture and antique-style furnishings exude a quaint charm, bringing vacationers back to the colonial days. Guests will enjoy a full range of modern amenities, such as a private saltwater pool, fine dining restaurant complete with sommelier, library and meeting area. 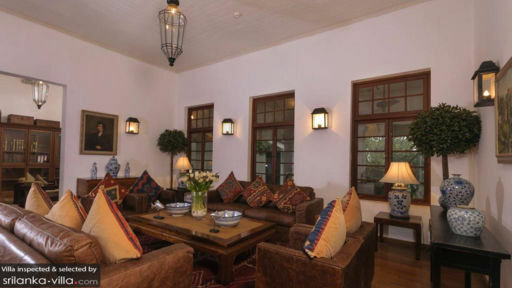 14 guests are comfortably accommodated across seven bedrooms. Three plush suites are decked out with four poster beds, down pillows imported from the Netherlands, quality bedding and elegant wood furnishings. The en suite bathroom features a vanity, toilet, shower recess and jacuzzi tub. The deluxe bedrooms combine colonial-style decor with modern amenities; the air conditioned interiors feature four poster beds, velvety rugs and carefully chosen ornaments and home accessories. A generously proportioned en suite is outfitted with twin vanities, a toilet and shower recess. Taking a dip in the sparkling saltwater pool or lounging lazily by one of the poolside loungers are some of our favourite ways to start the day at D Pavilion. The poolside area is also where guests gather for sundowners and afternoon siestas. D Pavilion offers multiple living spaces, all of which are finely appointed and equipped with modern amenities. The open-air living area is set along the veranda, and comes outfitted with armchairs, coffee tables, hanging lanterns and ceiling fans. The library, a cosy, wood-dominated room featuring an extensive collection of books is a spot ideal for unwinding quietly. A capacious dining area comes complete with an eight seater dining set. Guests who are on a corporate retreat will appreciate the fully equipped meeting room. D Pavilion stands out with its impeccable service and wide-ranging on-site amenities. Enjoy a variety of cuisines at The Gables, D Pavilion’s on-site restaurant. A sommelier will recommend the best wines from the cellar, and custom designed dining ware completes the fine dining experience. A cricket-themed bar features a private lounge, screenings of cricket matches and live music acts. Private dining experiences may also be organised at Dili’s Turf and Chef’s Table at the Kensington Oval, a sporting facility located in Bridgetown. D Pavilion is located along Stratford Avenue, Colombo. 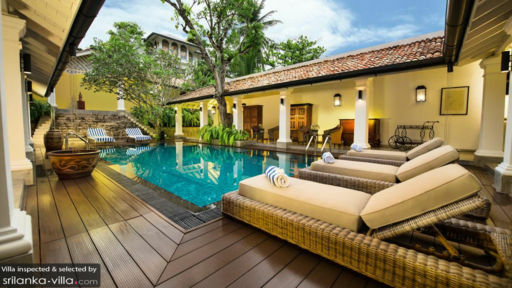 As the capital city of Sri Lanka, Colombo buzzes with an energetic vibe, and is home to modern buildings, beautifully preserved temples, religious sites, shopping malls and parks. Take a stroll along Galle Face Green, an urban park with uninterrupted vistas over the Indian Ocean. It’s a popular venue for picnics, kite flying and sampling street food fare from vendors. Another postcard-perfect spot is Mount Lavinia Beach; it’s a great place to enjoy fiery sunsets and beachfront dining. Must-sees for culture buffs include the Gangaramaya Buddhist Temple. The exterior is intricate and unique, with a mix of Sri Lankan, Thai, Indian and Chinese architecture. Asokaramaya Buddhist Temple, one of the oldest Buddhist temples in the city contains a collection of colourful paintings and sculptures. It’s also just two minutes’ walk from Gangaramaya. Other noteworthy religious sites include the Jami Ul-Alfar Mosque and St. Thomas Chapel. Senses Spa at The Kingsbury offers multiple options for a relaxing spa treatment - from hot stone massages, to facials and bath treatments. Or stretch it out on a yoga mat at studios like Prana Lounge or Prana Yoga Lanka. Your villa manager will readily assist if you prefer private classes conducted at the villa. The city center - located about 30 minutes’ drive from your villa - offers a variety of fine dining venues and cosy bistros. Places that come with our recommendations include Graze Kitchen, California Grill, Paradise Road Tintagel and Café Français.